It's....RACE WEEK! MIMM, Playlist, and Goals! 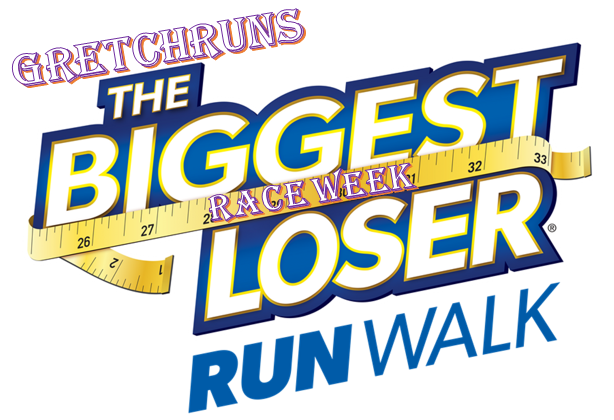 Gretch Runs: It's....RACE WEEK! MIMM, Playlist, and Goals! Outdoor yoga with my mom and sister! My sister just moved back home from California, and I got to see her a lot this weekend. She wasn't so much a fan of the yoga, but my mom and I loved it! Hofbrauhaus for dinner! My favorite restaurant. Dan and I got a sampler platter to share- filled with wurst, schnitzel, cabbage, and German Potato Salad. Not my favorite dish I've ever had there (the sauerbraten is my favorite) but it was still good! We went out for dessert afterwards and I had an AMAZING fro-yo. Delicious! My adorable little beer beside Dan's liter. The seasonal was higher in alcohol content, so they only serve it in 1/3 liters. I made sure to get some hefeweizen afterwards! A Goal : 1:50:00. This is 8:24 pace, and may be a little faster than what I'm in shape for right now. This is my "reach" goal if everything on race day goes perfectly! B Goal : 2:00:00. I've run quite a few half marathons, and have never broken the magical 2 hour mark. In longer races, though, I've crossed the half marathon point in under 2 hours, so I know that I can do this! This is my main goal for the race and what I really want to do. This would be a PR for me! C Goal : 2:05:00. This would be a 9:33 pace, which is definitely do-able for me. If it's a really warm, humid day and I'm not feeling great, I'll be happy with this time. 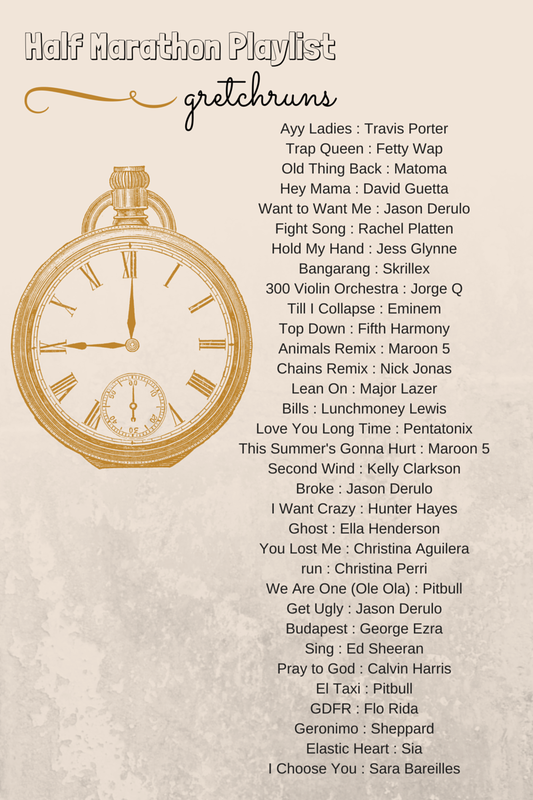 And now for my playlist - a mix of fast songs, slow songs, rap, hip-hop, pop, classical, Latin, and country. I like to keep it varied while I'm running so I don't get bored! If you're interested in seeing my playlist for the race, check it out here on Spotify. I hope that you all have a great week! Linking up with Katie for MIMM! 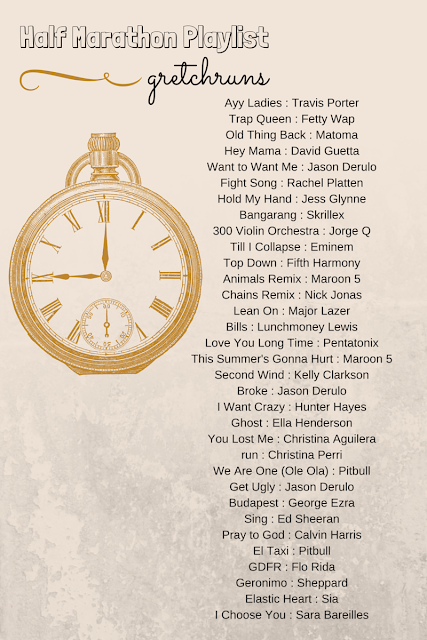 LOVE the playlist! Adding some of those songs to mine right now : ) I'm so excited for your race, and I hope you enjoy taper time!! Have a great Monday! Yay, glad that you liked it! I'm excited too..I've never trained so well for a race before! Have a great week! Hope you like the songs! And we can both do it (eventually...haha!) If I don't get it in this one I know I can do it in the fall, and so can you! Thank you Alison! Now I feel the pressure..haha! Good luck and think you are only going to get your A goal. You got this!!! Okay, you've made me put outdoor yoga on my bucket list for this year. I really want to do that and I have no idea why. It just seems like yoga was meant to be enjoyed outdoors! Also loving your running playlist. I love a lot of those songs and I can imagine the remixes would be very motivating! I've been very close several times to the elusive sub 2:00 but can't seem to cross under. I think you'll definitely do that and much more! Biggest Loser does a good job with the free photos. I've run several of their races. Good luck and enjoy your race. I can't wait to hear about it. Thanks so much! I'm in the same boat..can't seem to break it. Thanks for the encouragement! Good luck with your upcoming race!!! I am so excited for your race! I know you have been doing so awesome throughout the whole training, and I know you're going to do just as awesome in the race! I can't wait to hear how it goes.